With Valentine’s Day just round the corner I am feeling the love in the air and adoring all of these very cute Valentine’s Day products that lush have got to offer at the moment. The Heart Throb Bubbleroon has got to be one of the most perfect looking products for a Valentine’s Day range. Shaped like a little red heart this product just shouts out ‘VALENTINES DAY’. 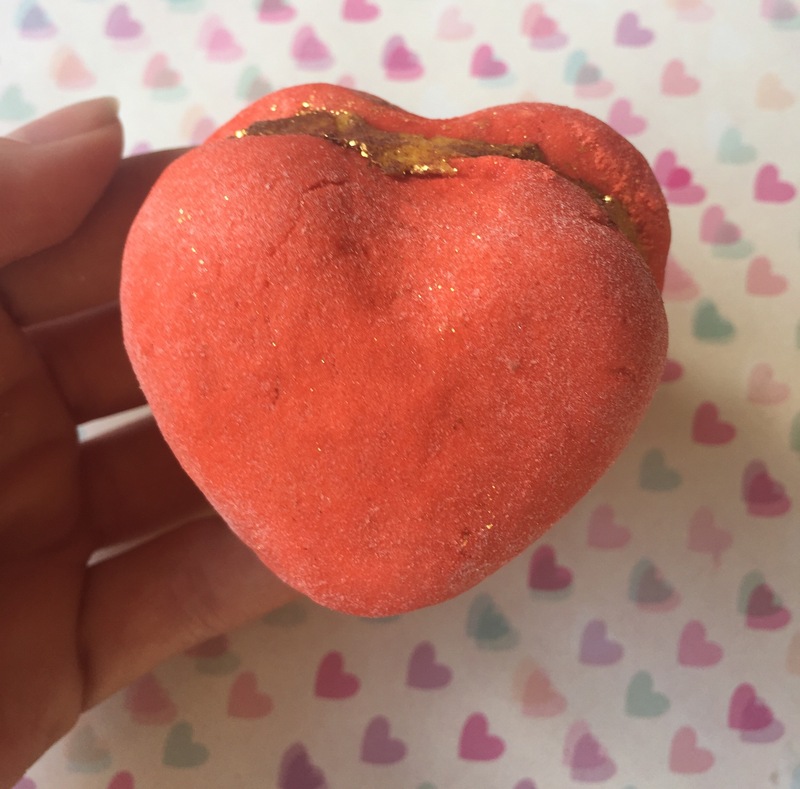 The Heart Throb bubbleroon is an exclusive to lush Oxford street this Valentine’s although it has made a little appearance on the lush kitchen, but if like me you don’t live very close to London it can be quite difficult to get your hands on an exclusive product. What I like most about a bubbleroon is that it is a very moisturing product. Bubbleroons are basically two small bubble bars sandwiches together with a good helping of Shea butter (almost like a little cake). It is this element of Shea butter that adds the wonderfully moisturing quality to the product. 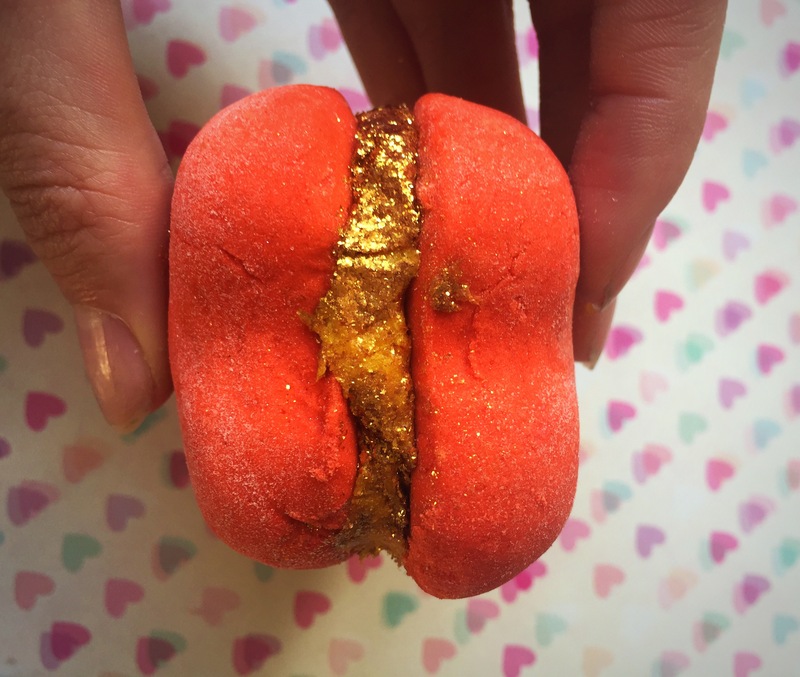 What is extra special about the Heart Throb bubbleroon is that the Shea butter is covered in lots and lots of super sparkly gold glitter. The scent of heart throb bubbleroon is very interesting and quite hard to describe. I’m also afraid to say it is one that I am not very keen on at all. Featuring ylang ylang, vanillia and frangipan the bubbleroon have a very flora scent, although i found the scent to be a very heady and spicy floral scent rather than a sweet floral scent. The scent is nice and strong though meaning that once crumbled into the water the scent is not completely lost and it is still possible to pick up elements of its floral notes. 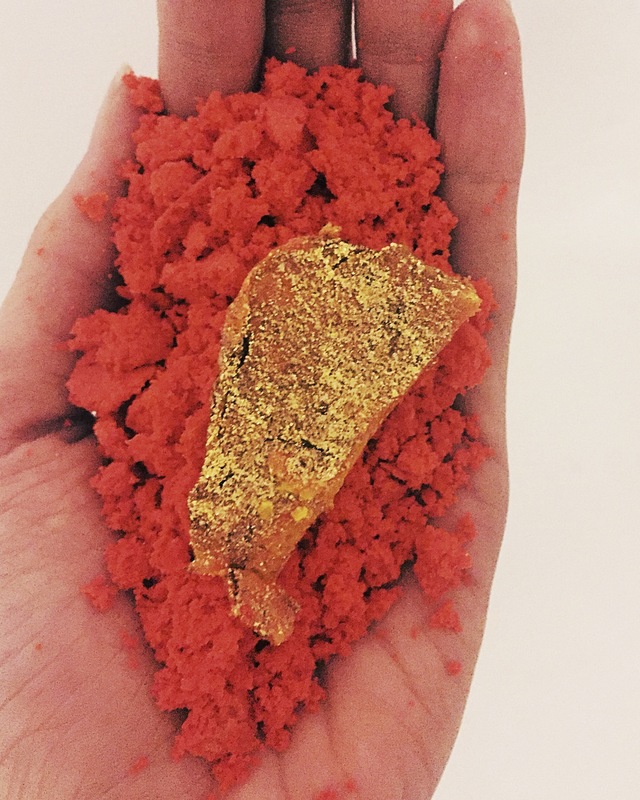 Bubbleroons are super easy to break up and crumbed into your bath water and the heart throb bubbleroon is no different. The two section break in half perfectly meaning you can save one half of your bubbleroon for another bath. The product is also quite soft meaning it crumbles very well into your running water. Once in the water the heart throb bubbleroon turns the water a lovely bright red colour and creates lots and lots of fluffy white bubbles. One half of your bubbleroon defiantly creates the perfect amount of bubbles for a luxurious bath. Overall all though I am not very keen on the scent of this product (just due to personal taste), I love it’s moisturing quality and how soft my skin felt once out of the bath. I actually also love the subtle scent it left and my skin (maybe I just found the scent a little two strong when the product was whole). OMG this is SO CUTE!!! I love bubbleroons ..they are so easy to break up in the bath so you can get multiple uses! !